All ranks for our Black Belt Instructors are internationally recognized and have been awarded through stringent testing in front of a grading board made up of numerous senior ranking Black Belts from the Okinawan Shorin-Ryu Shorinkan Karate Association. Sensei Tim presently holds the rank of Sandan, 3rd Degree Black Belt and has been studying karate since he was a Little Dragon beginning at age 4. Sensei Tim enjoys bringing to his teen students a variety of bunkai applications and kobudo kumite skills. 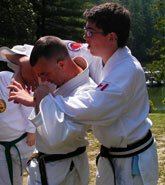 Sensei Tim is an active teacher for the teen classes. Sensei Yanick holds the rank of Nidan, 2nd degree Black Belt. He is a dedicated teacher for our Dragons, Senior Kids and Teen classes. Presently studying towards his university degree in physical education, Sempai Yanick brings his enthusiasm to every class! Sensei Patrick holds the rank of Nidan, 2nd degree Black Belt. He enjoys instructing our Dragons, Senior Kids and Teen classes. Sempai Patrick is a dedicated instructor who enjoys passing on his kata skills and his sparring knowledge to the students. Sensei John holds the rank of Shodan 1st degree black belt. He regularly assists in our Senior Kids and Adult classes. Sempai John is a dedicated instructor who enjoys refining the students' stances and blocks. Sensei Olaf holds the rank of Shodan, 1st degree black belt. He is a patient and meticulous teacher with our kids, teens and adults. Sensei Olaf enjoys dissecting his kata and perfecting his moves. He studies the details and shares this knowledge with the students. Sensei Linda holds the rank of Shodan, 1st degree black belt. She also holds a black belt in Wado-Ryu Karate. She often assists the kids, teens and adults. Sensei Linda has a wealth of experience and knowlege in traditional Okinawan karate to share.